TriggerCharts Radar provides a series of market profiles (Volume-at-Price) which dynamically calculate and display a sideways, color coded frequency distribution histogram that is set to a user-definable fixed number of look-back bars. These “profile maps” are overlaid onto price bars to graphically represent areas of market balance and imbalance where the market is likely to move slowly and horizontally—versus fast and directionally. 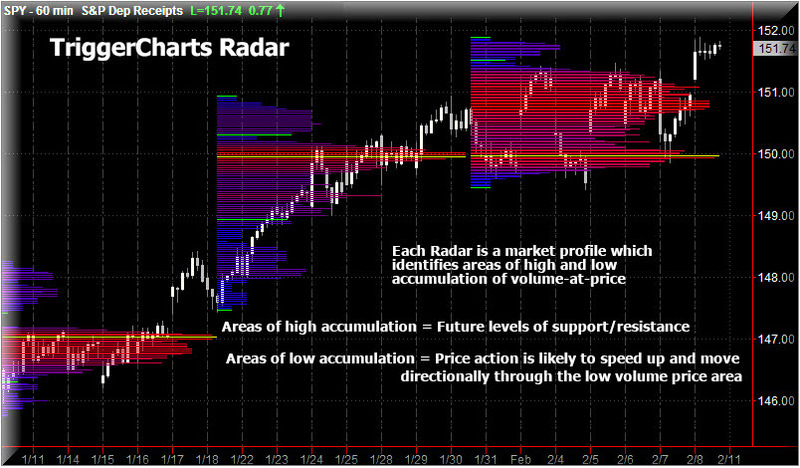 Radar profile maps employ the concepts of statistical probability distribution and have their basis in Auction Market Theory and Market Profile®. Radars (profiles) reveal that markets have the tendency to trade slowly and horizontally while within the RED areas of each Radar and trade rapidly and vertically while outside the developed RED areas. Radars are especially intuitive in longer time frames by orienting traders to the general “tone” and “tempo” of the market. When price is inside the RED areas, the market bias is horizontal and we anticipate strong support and resistance at the extremes of the value area. When price does break out of the RED and passes beyond the GREEN segmentation lines, the market bias is vertical and we anticipate the previous value area to become support or resistance. 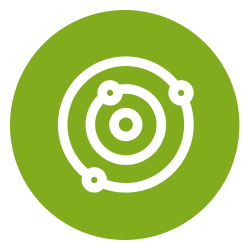 Create multiple, independent, and simultaneously displayed Radars to get a broader perspective of how past and present time-at-price affects the current market. Consider putting more than one Radar indicator on a chart with different NumOfBars and Density to gain a refined look at the market profile. Num Of Bars Sets the number of price bars back where each Radar should start. A more developed area on each Radar which reflects a relatively higher concentration of volume-at-price. Each Radar will have a horizontal yellow line or lines indicating the “fattest” part(s) of the profile (most volume traded at that price). These are called the Point of Control (POC) in Market Profile® nomenclature. Represents an area where there is relatively less volume-at-price compared to the red areas but relatively more than in the blue areas. Represents the narrowest areas on each Radar where there is the lowest concentration of volume at price. Shows the outlier areas in Radar’s range. These show the segmentation/breaks on each Radar’s zones which are dense to those with price at volume levels that are least represented in the Radar’s market profile.